Sometimes I feel a need to apologize. Like everyone, I harbour a few regrets, wish some things were a little different and others a trifle easier. Mostly though, I feel like I’m in a hurricane’s eye. Things are calm here, they’re nice, and yet all around me seems awhirl in furious thunder. While so many are so angry, I’m happy. Sorry. Am I missing something? I’ve recently seen two sources of curious anger that gave me pause. Hockey is a great sport. Unlike football and baseball, offense and defence flip with no time for pauses or plans. Its beauty is the patterns in the chaos. Hockey culture, on the other hand, is another thing altogether. I’m not talking about the billionaire’s business posing as sport, but children’s hockey. It’s not the kids’ fault. Nearly all of them are there for the fun but too many parents see games as invitations to display their character’s worst colours. They yell at referees, coaches, their kids and other peoples’, and sometimes even each other. Those yelling loudest are always those who understand the game least. How many of those shouting for their kids to do this or that or about someone denying their kid opportunity are revealing personal rage regarding chances they didn’t take or doors slammed on their ambitions? How many parents are pushing kids and attacking others in blatant attempts to chase unrequited dreams through imposing them on their children? 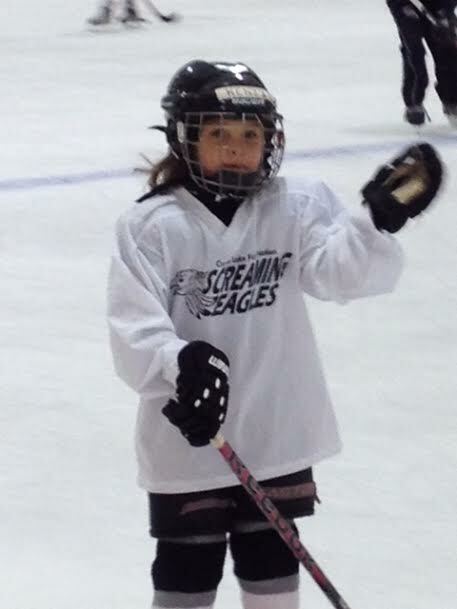 My seven-year-old granddaughter plays on two hockey teams and I love to watch her. The score is kept on the big board but tallying stops whenever the spread grows to more than three goals. Teams shake hands after every game. Afterwards, we ask only if she had fun. She never knows who won and never cares. Parents and grandparents laugh and cheer and shout nothing but encouragement. It’s great. Folks at other games are apparently different because the arena found it necessary to erect the sign below. I hope it helps those unable to park their regrets, fears, and vicarious dreams that manifest as ugly anger. I wonder, though, if those who need the sign ever read it, heed it, or even understand it’s for them. Last week I also watched a Donald Trump speech on YouTube. Trump is fascinating but it’s not the first time we’ve seen his ilk. In 1968, Alabama Governor George Wallace ran for president and attracted much the same people. Perhaps it is more accurate to say that he attracted the same emotion. In the late 1960s, like today, a great many people were afraid that their world was changing in ways they didn’t like or understand. They were mad. Women and African Americans were demanding equality, the economy was shifting from its long post-war prosperity, and America was losing a war in Vietnam. Now, gays, lesbians, and transgendered people are demanding equality, the industrial revolution is over with nothing to replace avenues for middle-class prosperity and working-class mobility, and America seems to be losing the war on terror. What can be done? One could delve into nuanced and complex causes and effects and accept that economic and social shifts take time and demand concessions from all sides. Forget that! There is no time for that nonsense when one’s life is happening now, children need their futures to start now, and a living must be made and debts paid right now. It is much easier to get mad at those deemed responsible for the disconnect between how life is and how it was expected to be. Wallace knew it then and Trump knows it now. Therefore, blame the desegregationists or the immigrants. Blame the other, whether it’s the other race, religion, ethnicity, lifestyle, region, party, and, of course, blame the government. Get mad at those who are causing the changes or not stopping them or refusing to acknowledge that the way things were before was better. Trump rides the difference between nostalgia and history. It’s why facts don’t matter and lies are accepted. His followers, like Wallace’s, yearn for a misty-eyed past that never really existed; when rules were certain, dreams assured, and everyone knew their place. It’s a fretful yearning that fuels anger, fills stadiums, makes signs, and fills lungs with desperate rage. It’s the same yearning that sparks screaming at little hockey loving kids. I don’t yell at hockey games. I don’t support Mr. Trump. I just can’t muster the necessary anger. This makes me neither better nor smarter than anyone – far from it. But I choose to be informed rather than bamboozled. I choose to be calm around children, knowing that they’re watching and learning how to behave and how to be an adult. Emotions are decisions. I choose to go outside, run, be with family, enjoy friends, play music, be childlike but not childish with children, set and celebrate achievable measurable goals, enjoy goofiness, and when I encounter one, to say right out loud, “This is a good moment.” In short, I choose not to be angry but happy. Happy is not a surrender of personal sovereignty, a rejection of values, or naive. Anger, on the other hand, is all three. Anger’s adrenaline is cheap tequila while happy’s endorphins is a fine wine. No one’s happiness led them to become a bully in the stands or to follow one behind a lectern. I’ll leave those yelling at Mr. Trump’s rallies and in hockey arenas to their rage. For me, happy is a better decision and the eye of the hurricane is a pretty nice place. I think I’ll stay. If you enjoyed this column, please consider sending it to others and checking out more of my work at http://www.johnboyko.com. Thanks John. I enjoyed this very much. Awesome. Really enjoy your writing and your ideas.